Altpick.com : News : Plunkert Illustrates Article About HBO's "West World"
Plunkert Illustrates Article About HBO's "West World"
As "Game of Thrones" is drawing closer to its inevitable last season, HBO is once again pulling out the big guns to invest in a proper replacement for our current water-cooler conversations: "West World". The show, for those who are unfamiliar, is about a near-future theme park, populated by androids (or robots), that lets people experience the Old West and live out their fantasies - in whatever way they choose. A recent article written by The Atlantic's Zachary Bickel focuses on the show's first few episodes, discussing how sympathy for "creations" (as opposed to their creators) have evolved over the years since Mary Shelley's "Frankenstein's Monster" and the questions of moral and human nature that are being brought up by the show. 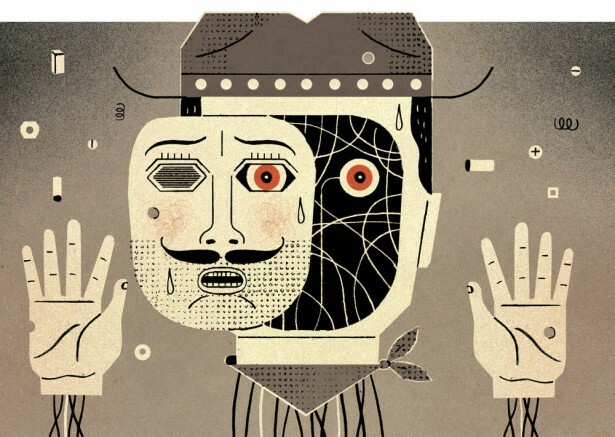 The illustration for the article (which can be read in its entirety in the link below) was illustrated by David Plunkert, brilliantly capturing the theme of both the show and Bickel's discussion.